There are a lot of fans that don t believe that I can do it. Maybe because of the last couple of fights, but things have changed and I feel great; I feel good. I m just ready to go. I believe Sugar Shane Mosley when he said that. And with the kind of push and motivation, challenge, training, conditioning, preparation and sacrifices he has had heading to his forthcoming showdown with the heavy favorite boxing master Pacman, he is most likely to win the bout but well against the opponents who defeated him or serve him a draw in the past from Vernon Forrest to Sergio Mora if he will be given a chance to turn the clock back and do it again. But against a Manny Pacquiao on May 7, it s an entirely different story. This is to bring up a couple of main points: One is Pacquiao will beat a Mosley in his prime. Two is even the best Mosley that Mosley can summon from himself at any given time in his career as a professional boxer, doing everything he needs to do to fight a Manny Pacquiao at the top of his game such as the transforming vicious one we have today and with whom Mosley would engage in a war a few days from now, Sugar Shane and his camp would then finally find out and sweetly realize in less than twelve rounds on fight night why most people and experts in the sport say that Pacquiao would win and even capably deliver their man the first and only knockout loss in his record. 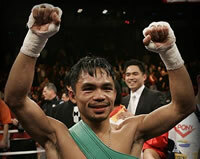 The Pacman is history in the making. His story isn t finished yet and Mosley just happens to become a part of that fascinating saga of a great sports legend. And as in a classical movie masterpiece, it would be anti-climactic to say at this point that Pacquiao is already the best and greatest boxer of all time. We are nearing the end, though. Decades or centuries from now, we all will be considered lucky and blessed by the future generations because we have in our generation a man who is rare to come in a lifetime or lifetimes.